BERLIN (AFP) - From sculptors to actors and filmmakers, Berlin has become a magnet for Syrian artists fleeing their country's brutal violence to a place where they can express themselves without fear. While Beirut and Paris have long been the destinations of choice for Arab artists, the German capital has in recent years earned a reputation as a more adventurous, progressive alternative for exiled creators. As well as offering affordable spaces to live and work, Berlin is “the city of anarchy and rock”, says Ziad Adwan, an actor and director who arrived two years ago after spells in jail back home. Once divided by its infamous wall, reunification energized Berlin as young people who grew up yearning to escape the stifling former East Germany met West German peers who had moved to the city for its special status that exempted them from military service. The combination produced an open-minded atmosphere -- and an uninhibited party culture -- that continues to lure artists from all over the world. Syrians have proved to be no exception. 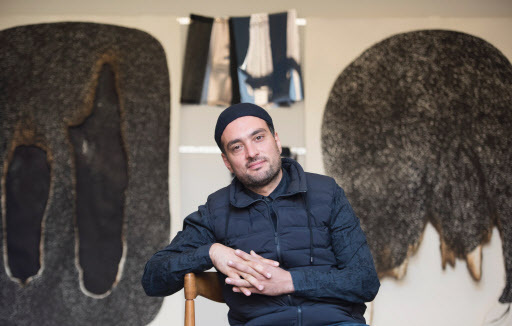 “The Berlin cultural scene has certainly taken on a new tone,” says Syrian Ali Kaaf, who has lived in Berlin for the past 16 years and teaches at the well-regarded Weissensee fine arts school. He helps around 20 refugee students each semester to find places in art schools, put together portfolios or recreate those lost in the chaos of their escape and arduous journey to Europe. Once the essentials of life -- having a place to sleep and food to eat -- are out of the way, many of the new arrivals find themselves among familiar faces. “Some of my students from the Damascus drama school where I used to teach now live in refugee homes,” says Adwan. “It’s just like Damascus here,” agrees photographer and journalist Doha Hassan, who has found old friends and acquaintances from the Syrian capital among her 600,000 compatriots who have fled to Germany since the war broke out in 2011. Still, Egyptian Basma El-Husseiny says that “it can be very hard for those who have just arrived to find their way” to resuming their studies or exhibiting works in German institutions. An activist with two decades of experience in the arts, she founded the charity Action for Hope that helps refugee artists through the thicket of German bureaucracy. Meanwhile, Adwan and German publisher Mario Muenster have come together to produce an English-language magazine, A Syrious Look, aimed at linking up the new Syrian diaspora with young German artists. What refugee artists have to express is often marked by the war within Syria's borders -- and by their own experiences on the long road to escape that conflict. Under Syrian President Bashar Assad, the ruling Baath Party ideology was forced on art schools, and some artists say the institutions were also riddled with corruption. One of the works by artist Sulafa Hijazi shows a woman’s naked body, supine and legs splayed as she gives birth to a rifle. Another illustration features a skull-topped sewing machine stitching red thread into a camouflage uniform. Some creatives have gone through subtler transformations. “I used to write dark, depressing pieces,” muses Rasha Abbas, a writer who won a grant from a foundation in Stuttgart. “It seems strange but since I'm here, my writing is full of humor,” she says, a smile playing across her face framed by waves of dark hair. Some comfort on the path into an unknown future is the fact that they are living in a city, Berlin, which has had to reinvent itself from scratch. “Damascus today is how Berlin was at the end of the war,” Muenster says.